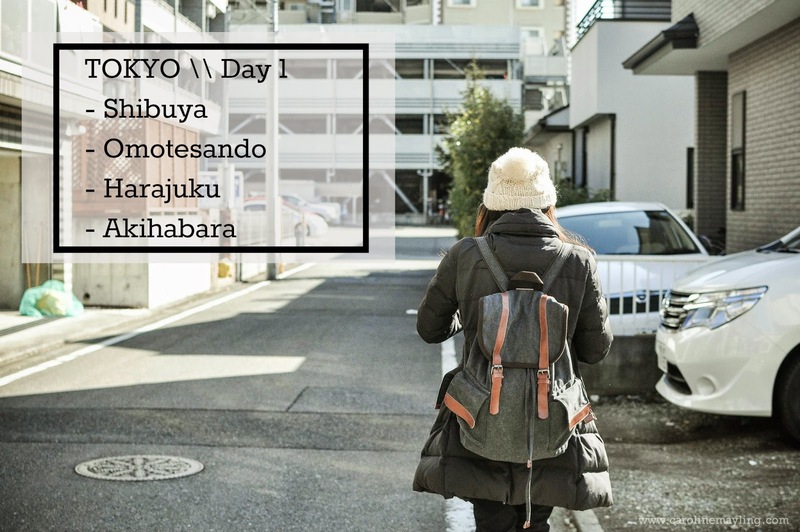 Before I start telling you about our first day in Tokyo, it's better to put leisure exploration of the city or shopping in your Day 1's itinerary. This is because you'll need some time to get familiar with the train routes. You won't want to put anything important schedule and end up late for that particular event. One more thing, pocket wifi or local sim card is crucial in order for you to access Google maps during your entire trip. We didn't want to rush our days in Tokyo and decided to just explore Shibuya. Shibuya is a very, very busy city indeed. It is very crowded and packed with teenagers. So... What to do in Shibuya? Shibuya Crossing, famous for its scramble crossing! I bet you've seen it on some movies such as Resident Evil and Fast & Furious. One of the best spots to watch the scramble crossing is at Starbucks, you can grab a cuppa and sit by the window to chill and enjoy your view. With Reina's help, we are able to take an obligatory photo at the scramble crossing! Hachiko Statue, which is well known for the story behind about a loyal dog who waited on his late master at Shibuya Station every day from 1923-1935. It is also now the most popular meeting point at Shibuya! Tokyu Hands, a well known Japanese department store where you can find tons of DIY stuff! I came here for its stationaries section! If you enjoy doing crafty stuff or scrapbooking, here's one of the perfect place for you to get all your items. The staffs are very friendly and helpful too! If you already know what you want to get, just show them the picture of the item and they will bring you to the correct section. It's really huge inside! Loft, similar to Tokyu Hands where you can find tons of products related to hobby and crafts, as well as interior products including hip and functional furniture. I came here because I couldn't find the Hobonichi notebook in Tokyu Hands. I personally enjoy shopping at Loft compare to Tokyu Hands in terms of stationeries! Oh, there's a floor that selling an array of skincare and cosmetic products here too! Guess what? Eric found various sake and other alcohol beverages at such a cheap price here too! Disney Store, where you can purchase your DisneySea and Disneyland tickets in advanced! Of course, buy all the adorable Disney's merchadises here too! By purchasing your ticket in advance can save your time queuing at DisneySea and Disneyland too! We then met up with our friend, Reina and she brought us to have a quick stroll in Omotesando before grabbing our lunch. I personally love the vibe in Omotesando, it is more of an upscale area with plenty of designers' stores around and not as packed as Shibuya. Reina treated us a yummy lunch at Smoke Grill & Bar! I am so in love with my perfectly done pancakes! After the lunch, Reina brought us over to Harajuku, the opposite of Omotesando. Harajuku is a heaven for fellow cosplayers. You can easily spot cosplayers with their fancy costume and characters. Walk along the Takeshita Street and you can find tons of shops selling fancy costumes, cosmetics and all the knick knacks that cosplayers ever need. Takeshita Street, is a pedestrian-only street lined with fashion boutiques, cafes and restaurants in Harajuku. It is very crowded especially during the weekends and holidays. You'd be amazed to see all the shops selling interesting costume to caters fellow cosplayers here. Do not forget to order a crepe for yourself in Takeshita Street! Apparently, it's famous for the crepes too! They're yummy and eat whilst you enjoy strolling along the street. LINE's Store, here's where you can get your favorite LINE character merchandises! Everything were so cute, a tad pricey tho. Reina then brought us to Akihabara, a heaven for fellow otakus in the world. This is the place where you can buy all sort of video games, manga, anime and computer goods at cheap price. Apart of that, maid cafes are everywhere here too! That's all about our Day 1 in Tokyo! Hope you guys enjoy watching the vlog!